Photo by Chris Bosak Pine siskins visit a feeder in Danbury, Connecticut, March 2019. During my college years, one of the drinking games we used to play was “One up, one down.” Those who knew the secret would always get the right answer and not have to drink. Those who guessed wrong had to drink. I’ll give away the secret and spoil the game because I doubt a lot of college students are regularly checking in with BirdsofNewEngland.com. Anyway, one player raises both hands, one hand or neither hand. (It’s actually a bit more complicated, but you get the idea.) Another player has to say “one up,” “two up,” or “zero up.” The game only works, obviously, when new people are at the party; otherwise, everyone would always get the right answer. Well, the reason for that stroll down Memory Lane was that I was reminded of that game while watching pine siskins at my feeder during yesterday’s snowfall. Check out the photos and you’ll see why. See, I told you it was a stretch. A pine siskin perches on the top of an evergreen in Danbury, CT, March 2019. For the third consecutive day, southern New England was hit by an overnight snowfall. None of the “storms” amounted to much in terms of accumulation but they did create some good bird photography opportunities. Photo by Chris Bosak A pine siskin perches on the top of an evergreen in Danbury, CT, March 2019. Photo by Chris Bosak Pine siskins visit a feeder in Danbury, Connecticut, fall 2018. Just kidding. That was me writing two weeks ago about the hot start to the winter finch season. The wise man part is up for debate. At the time of that writing, a female purple finch had been my only out-of-the-ordinary sighting at my feeding station. A week later a few fox sparrows showed up. I know fox sparrows are not finches, but they can fit loosely into the category of winter finches because of their sporadic visits to New England backyards. Every perch on the hopper is filled and the rest are on a nearby hopper feeder or on the ground. They are eating Nyjer and sunflower seeds. Photo by Chris Bosak A pine siskin eats Nyjer seeds at a feeder in Danbury, Conn., fall 2018. Pine Siskins are often confused with goldfinches because they look fairly similar and prefer Nyjer (or thistle) seeds. Siskins are a bit larger, more sleek, more streaked and have a longer, pointed bill. The heavy streaking, especially on the sides, and yellow wing and tail markings are the best clues to differentiate the species. The male siskins have more prominent yellow markings. So today I celebrate that the siskins have arrived. The birds, however, have a very healthy appetite and Nyjer seed is not cheap, so we’ll see how I feel if their numbers multiply. I’m sure I’ll continue to be inspired by their presence. After all, it’s been about 10 years since I was a part of one of their irruptions. I think I can splurge once a decade on them. Here is a photo of them with goldfinches. Note the differences in plumage. The goldfinch is on the lower right. 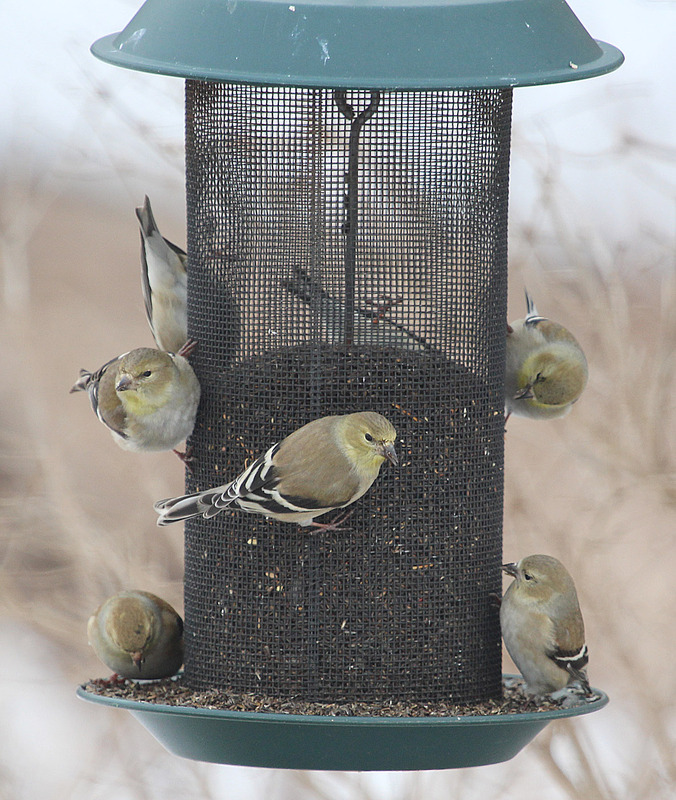 American Goldfinches eat from a feeder at Cove Island Park in Stamford, March 2015. 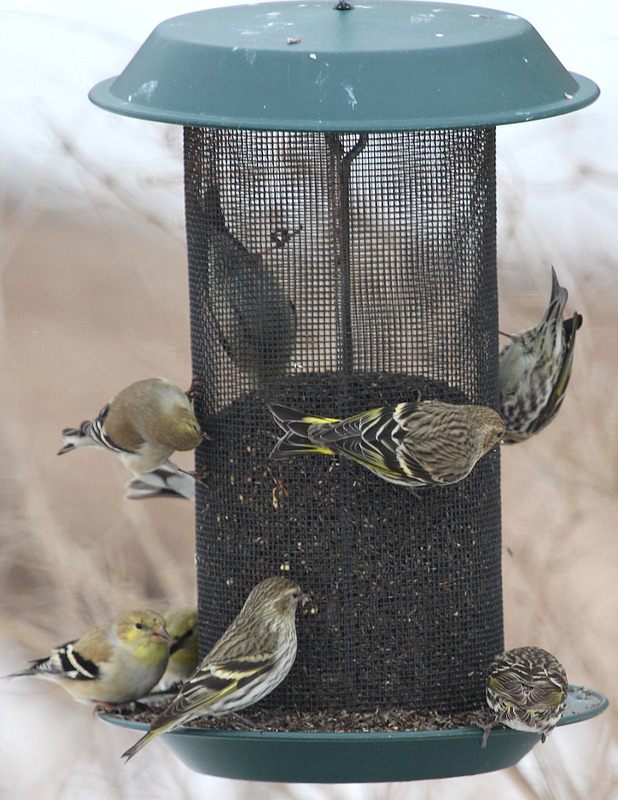 Pine Siskins and American Goldfinches share a Nyjer feeder at Cove Island Park in Stamford, March 2015. What’s the difference between these two photos? It’s not one of those find 10 subtle differences puzzles, but rather a pretty simple quiz and lesson in paying attention closely to your feeders. These photos were taken about 10 minutes apart the other day at Cove Island Wildlife Sanctuary in Stamford, Conn.